Evidently, framing and managing strategies for a contemporary organization has become an indispensable activity of corporate management. At the helm of affairs corporate management and strategy cannot be exclusively identified. With companies are becoming manifold in their presence operations, the session shall expose the students to modern practices of strategic management. The session is also expected to broadly cover the scope of strategic management process, environmental analysis, grand strategies and bench-marking. As the head of Cameron’s India Operations (CMI) he has been very instrumental in setting up Cameron’s engineering Centre of Excellence (COE) at India. 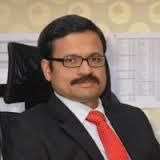 He has 15 years of professional experience in manufacturing, service & consulting industries. He has inoculated the efforts to brand Cameron among leading Universities in Coimbatore and pool in the best talent emerging out every year from the universities to join CMI talent group. He has professional association with Institute of Chartered Accountants of India (ICAI), Key contributing member in the manufacturing panel of Confederation of Indian Industry Coimbatore Chapter & American Chamber of Commerce. Cameron engineers, designs, and manufactures flow and pressure control technologies for customers working in the oil and gas industry worldwide. As a global organization it provides support and delivers services using these leading technologies. It is also noteworthy that Cameron became the first company capable of designing and delivering a complete underwater drilling system. Today, Cameron is part of Schlumberger Limited, delivering a comprehensive portfolio of “pore-to-pipeline” products and services to the global oil and gas industry.